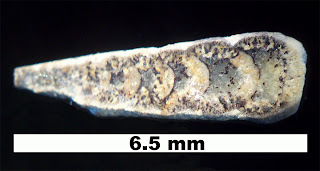 The Haplostiche "Nodosaria" texana fusulinid found in the Weno Foramation (Comancheon) of Denton County, Texas. Fossils are dated to the early Cretaceous. Thanks to Dave at the Views of the Mahantango blog for the specimens. I believe he acquired them from an old estate collection for Oklahoma or Texas. Species was named by Conrad in 1857. 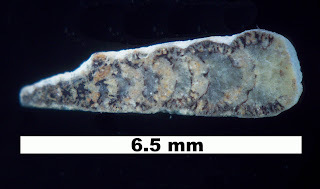 Thanks to Michael at foraminifera.eu for the reference citing this fossil. 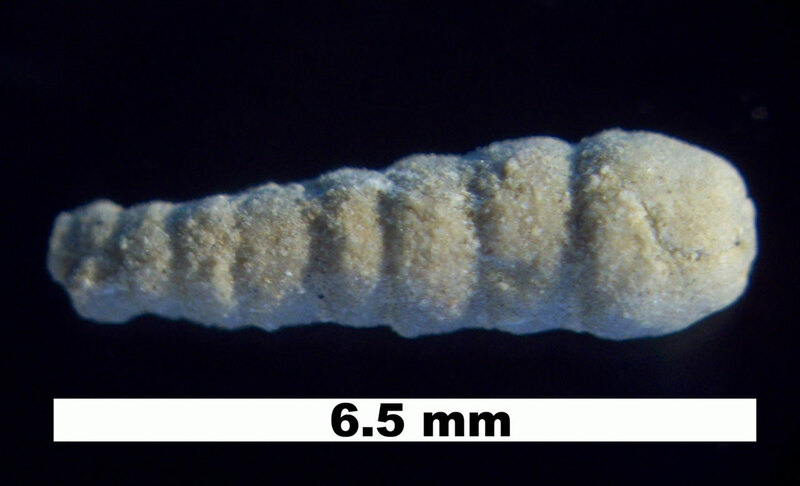 Bulletin Foraminifera of the Cretaceous of Central Texas (March 22, 1926)) by Dorothy Ogden Carsey lists a description on page 36 and shown on Plate 6, Figure 10. Test large, elongate, usually straight; chambers gradually enlarging, each younger one enveloping the anterior portion of the immediately precedingone ;initial extremity slightly pointed, ultimate end broadly rounded to slightly protruded; aperture terminal, consisting of rounded to subovate orifices regularly arranged in a semi-radiating manner around a central opening of about the same size; surface of shell marked by rather closely set depressed suture lines. Length usually not exceeding 9 mm., occasionally much longer. Nodosaria texana occurs rather commonly in parts of the Del Rio formation and has been occasionally observed in the Buda limestone. This blog posting contains images from two different specimens that were roughly the same size and photographed using a microscope set at about 30x. I tried in my amateurish way to show the chambers of the second specimen by sanding it on different grit sandpaper. The black sandpaper appears to have embedded grit into the specimen though. Maybe a better way is to glue a specimen to a wood dowel and sand till half way through the specimen and then remove it. Turn over the specimen and glue the flat side to a glass plate and then sand till it is very thin.